Needless to say, the pressure is extremely high on Happy New Year’s music. From Kashmir main, Lungi dance, Titli, the songs of Chennai Express are played on the radio during prime time. Needless to say, the pressure is extremely high on Happy New Year’s music. Despite its blaring volume, quick tempo, loud drum beats, Indiawaale grows on with you with vocals by none other than Shankar Mahadevan, KK and Vishal Dadlani. Sadly, one barely gets to hear Neeti Mohan of Jiya re (Jab Tak Hai Jaan) fame. Just like all of Shah Rukh Khan’s home productions, Happy New Year also consists of a sweet love song, titled Manwa lage by Shreya Ghoshal in a duet with Arijit Singh, but the song is clearly all hers. Upon hearing Satakali, you realise that over-powering techno beats have been excessively used. While the track by Sukhwinder Singh has catchy lyrics by Irshad Kamil, the song manages to deafen you within the first 30 seconds itself. In comparison, Lovely with Kanika Kapoor as its lead singer is much more soothing with its hip hop beats. This sassy number manages to stand out in an album loaded with loud songs. It has another version, titled Kamlee. 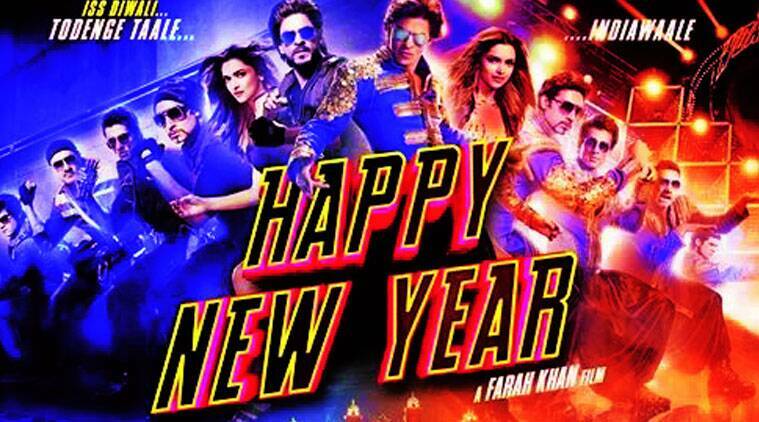 HNY’s album also consists of a medley, named World Dance Medley which is just a compilation of the songs in HNY. The film has even tried to appease Mika Singh fans by inserting his Nonsense ki night and it has some hilarious lyrics by Vishal and Shekhar. After listening to Dance like a chammiya, you’re convinced that Sunidhi Chauhan has lost her touch. In a duet with Vishal Dadlani, she fails to impress. Sharabi will make you wish you were sharabi, unless you love bhangra pop. If you do, then you’ll find yourself shaking it up to this song by Manj Musik and Nand Kumar. The heist (Instrumental) by John Stewart Eduri has been evidently inspired by the background scores of other Hollywood spy flicks, it’s not a bad listen. However, those who love techno and electronic beats will find themselves drawn towards HNY’s music.